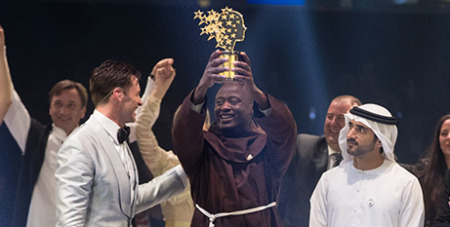 A Franciscan friar and science teacher from rural Kenya, who gives away most of his salary to support poor students, has won one of the world's richest teaching awards. Source: ABC News. Br Peter Tabichi was awarded the $US1 million ($1.4m) prize in recognition of his work in a deprived school that struggles with crowded classes and few resources. "I feel great. I can't believe it. I feel so happy to be among the best teachers in the world, being the best in the world," he said after the award ceremony. Br Tabichi teaches at Keriko Mixed Day Secondary School in Pwani Village, where 95 per cent of his students live in poverty and 30 per cent are orphans or from single-parent families. "The school is in a very remote area – most of the students come from very poor families, even affording breakfast is hard," he said in a statement released by the Global Teacher Prize. Social issues such as drug abuse, teenage pregnancies and early marriage all contribute to high dropout rates from the classes crammed with as many as 80 students, he said. He said he planned to use the prize money to improve the school and feed the poor. Br Tabichi said despite the challenges his students faced, with hard work their skills were improving. "I'm immensely proud of my students," he said. "We lack facilities that many schools take for granted, so as a teacher I just want to have a positive impact, not only on my country but on the whole of Africa." Kenyan President Uhuru Kenyatta said in a statement that Br Tabichi's story was "the story of Africa" and one of hope for future generations. Br Tabichi was selected from 10,000 applicants. The Global Teacher Prize is awarded by the Varkey Foundation, whose founder, Sunny Varkey, established the not-for-profit GEMS Education company that runs 55 schools in the United Arab Emirates, Egypt and Qatar. Now in its fifth year, the prize is the largest of its kind, and has become one of the most coveted and prestigious awards for teachers.